The community along the Central Corridor in St. Paul has been asking for extra train stops at key intersections since the light rail expansion was conceived. Just a few weeks ago, they got them. Community groups, neighborhood organizations, local elected officials and individuals have been working with federal, state and local officials to find funding and political support for the stops. A celebration was held at Arnellia’s on University Avenue on Feb. 8 to enjoy the sweet success of good old-fashioned community organizing. 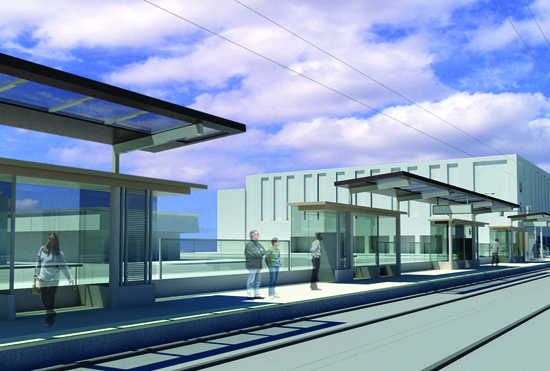 With local businesses worried about revenue during construction, lawsuits being filed against the proposed light rail route and an inadequate amount of train stops, many community members have been hesitant to welcome the transit project. This victory was one felt deeply by those who worked hard to achieve it, and the party at Arnellia’s was well deserved. The local pub was full of community members, leaders and organizational representatives. People from Isaiah, CSP, Jewish Community Action, Alliance for Metro Stability, ASANDC and more were there to cheer the funding of the new stops. City Councilmembers Russ Stark and Melvin Carter III were there as well. The party filled the back room of Arnelia’s with laughter and noise: specifically singing. A song written for the occasion was chanted by everyone, and was definitely the highpoint of the evening. “We’ve been hoping for this for a long time,” said Metric Giles, a board member of the Aurora/St. Anthony Neighborhood Development Corporation. The Stops for Us Coalition: »Alliance for Metropolitan Stability »Asian Economic Dev. Association »ASANDC »Community Stabilization Project »District Councils Collaborative »Got Voice, Got Power! »Hmong Organizing Program, TakeActionMN »Housing Preservation Project »ISAIAH »Jewish Community Action »JUST Equity »Minnesota Center for Environmental Advocacy »Model Cities »MICAH »Preserve and Benefit Historic Rondo Committee »Saint Paul NAACP »Saint Paul Urban League »Transit for Livable Communities »UFCW Local 789 »University UNITED »University Ave. Business Association.